Perfect-Curve Design- With the support from the unique header design, Satellite provides the true curve that is better than any other curve tensioned fabric pop-up system in the market. 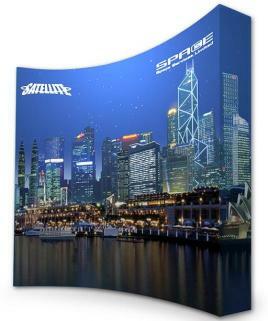 Boxed Aluminium Frame- Satellite has the same boxed aluminium frame as Neo, our best selling pop-up system. This well-built frame has increased its sturdiness to a whole new level. User Friendly Set-Up- There are two sets of locks on our latest stretch fabric pop-up, mechanical and magnetic. Simple click all the mechanical locks on the centre row together. Then, a gentle push will keep the magnetic locks connect automatically. Easy Graphic Attachment- Satellite’s built in Velcro frame provides a perfect guide for graphic attachment. Simply match the Velcro on the back of the graphic to the Velcro frame. Then, wrap the two ends of the graphic to the Velcro-ready hubs at the back of the frame. Your truly seamless display is done. Stability & Adaptability- The adjustable stabilizing feet on the bottom hubs helps your display to stand firm on any kind of surface. Simply twist in and out to accommodate the uneven floors. Compact & Portable- Once the graphic is removed from the rear hubs, unlock all the mechanical locks, and the whole system can collapse and pack into our wheeled transit bag. The whole package is only half the weight of a traditional pop up. Various Size Options- Satellite is available in curved and straight frame configurations, in a choice of 3x3 or 4x3 frame sizes.